Tips to avoid deceptive marketing tactics when purchasing a therapeutic laser. In the United States alone, treatment of soft tissue injuries as well as acute and chronic pain exceeds $100 billion in annual services. Additionally, some laser treatments are now covered by insurance, making laser therapy effective and lucrative for medical practitioners. As a result, many distributors are out to exploit this emerging market. Below is a list of 10 key points to help you make a smart laser purchase. Average power is a measured in watts (W) and quantifies the photons laser light energy delivers per second. Too little average power and the number of photons required for effective results fall short. Average power also helps determine treatment time. Lower average power generally means longer treatment time. Conversely, an average power that is too high, especially in continuous wave (CW) lasers, creates a thermal risk. Measured in watts (W), pulse power (aka peak power) represents the maximum power of the laser. Pulse power must be considered in the context of whether it is a continuous or superpulsed wavelength. High pulse power of a superpulsed laser represents the potential to deliver energy deeply without thermal risk. Together with wavelength, pulse power drives tissue penetration. Consider the type and depth of tissues that will be treated when determining the average and pulse powers required for your practice. Pulsing is a way to manage the delivery of light energy and is measured in pulses per second or hertz (Hz). Continuous Wave (CW) laser emits with a pulse duration emissions at thousandths of a second. The result is heat buildup characteristic of CW wavelengths. 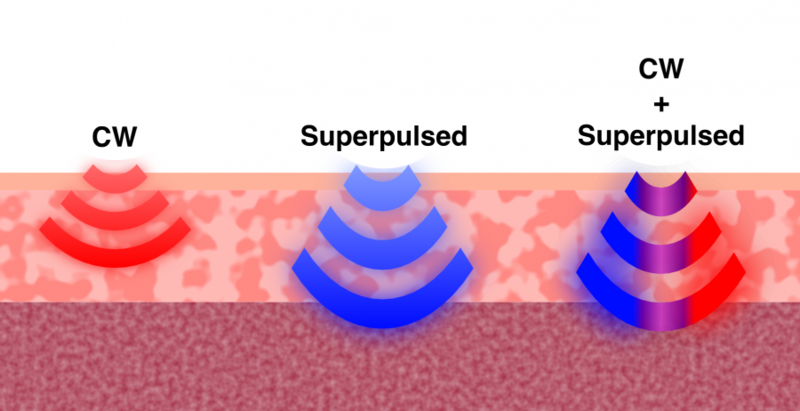 Superpulsed laser is exponentially finer, with emissions at billionths of a second and virtually no heat accumulation. Research into pulse rates identifies it as a key factor in turning genes on for cellular regeneration and tissue repair. When the laser can safely and effectively reach the area to be treated, deliver the correct energy needed and generate a pulse rate greater than 30 kHz (the amount demonstrated to enhance tissue repair), physiological issues are resolved at the source. Measured in nanometers (nm), which are billionths of a meter. Wavelength selection is determined by the type of tissue requiring repair. The therapeutic range is 600-1100 nm. The most versatile lasers are configured with a combination of superpulsed and continuous wave wavelengths. A common tactic in the deceptive marketing of therapeutic is “patented wavelengths”. Don’t be confused. Wavelengths are organic characteristics of light frequencies. Patient size and body habitus also drive the power configuration requirements of a laser. If your practice treats many large and/or muscular patients, you may benefit from reduced treatment times using models with higher superpulsed peak powers and higher continuous wave wattages. Those powers, when combined with a high pulse rate and focused to the correct depth of penetration, safely and gently regenerate tissue and reduce pain and inflammation. If treatment rooms are short on space or if easy mobility is desired a smaller desktop model may be a better choice over a larger wheeled model. Multiple peak power and wavelength configurations are on the market. A 45 W pulse power model also offers the options of interchangeable treatment lenses. Offering protection against manufacturer defects and design flaws, a warranty reflects the confidence of the warrantor in their product. If a company provides a short warranty you may be purchasing a used laser, an outdated model or a poorly made one. A laser with a warranty of 4 or more years reflects superior technology, well designed parts and a company that trusts the device will stand the test of time. Some laser distributors become difficult to reach after they have made a sale. They seldom offer on going support with device operations, troubleshooting or continuing education. Even fewer offer marketing materials that help integrate laser therapy into your practice. Find vendors who offer on going training, marketing, technical and continuing education support. Success comes from helping patients and a solid return on your investment. You’ll want the laser to have the ability to treat a variety of patients and conditions, be FDA cleared and offer ease of use. The result will show in the recommendations, testimonials and clinical reputation you build. The same should be shown by the laser company you choose. Ask how long their lasers have existed. Research the published outcomes. Look for the most advanced technology available. Consider the lifespan of the laser. Ask the distributor for contact info of customers with long term functioning devices and call them to determine their satisfaction with the device. Today’s lasers have the look and feel of R2-D2. Since arriving on the U.S. market in 1999, there has been a proliferation in therapeutic lasers available for purchase. There are floor models, hand-held models, desktop models and portable models. But with lasers, as with humans, outward appearances aren’t everything. What counts is found inside the machine, even if it does rekindle fond memories of a galaxy far, far away.